… what Jan Scannell had in mind with the Braai Day initiative… is nurturing and embracing a common South African culture, which is shared across all races and genders. Not one South African person can tell you that they have never witnessed a braai. Even in rural areas they light a fire and put their meat on it to cook. As a meat lover, I urge that on Heritage Day people Braai4Heritage and share their meat with those who do not have. 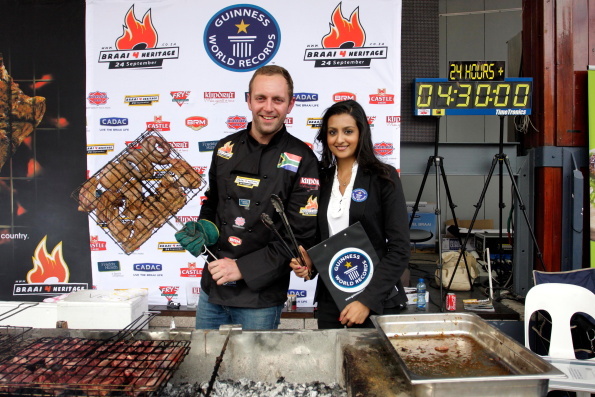 Not content with his efforts to date, Jan Braai set his sights on the ultimate accolade and recognition: a Guinness World Record for the longest (in time) braai ever. You know this record had to have been first thought up by a South African when you see the rules. You can only have ONE tong-master, but you're welcome to have a lackey to poke your coals and stoke the fire. You must also always have at least five different items on the grid at all times. This last rule clearly takes this out of the realms of being a barbecue and definitely defines it as a braai and Jan firmly stamped the mark of a braai with his meat selection: boerewors, steaks, ribs, vegetarian patties (yes, even veggies like braais), chicken wings and lamb chops. And best of all, he cooked everything on wood. No gas cooking here, though Cadac did supply some gas braais for backup. Like a true champ, Jan braaied to perfection, raised a bit of cash for charity (as they couldn't give the cooked meat away) and walked his way into the record books with a cracking time of 28 hours and 30 mins. Well done Jan. It's good to have a record designed for South Africans, held by a South African.